In the present era, the majority of the organization demands the best expert to manage business process and operation. They need to recruit top talent guys to improve the growth of the business. The candidates are selected through the technical interview and other processes. VMware is the leading cloud technology and virtualization and offers the best solution to desktop and network virtualization. 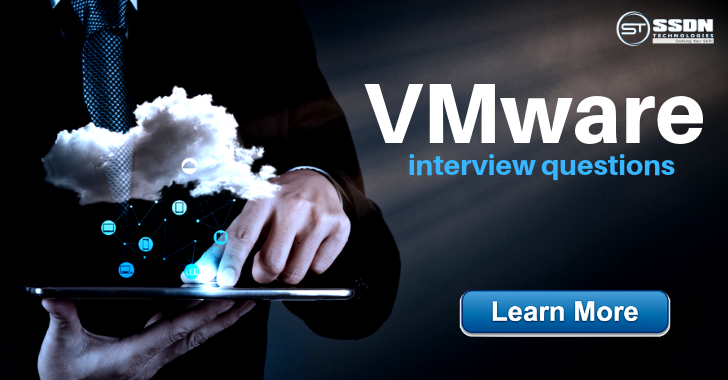 If you are a fresher or experience looking for the interview question regarding VMware, you are landed at the right place and read the important questions. It is a great opportunity for you to move ahead of career with VMware Certification. In this article, we list out the question asked in an interview about the subject that aids you to gain a dream in the organization. Here are questions on VMware. What is Meant by VMware? VMware is the process of virtualization of different kinds of operating system that used for one or more workstation and server. It surely meets the demands of various applications and software for the virtualization. The VMware products are differentiated into two different levels like server application and desktop application. Moreover, it is used for running application or operating system in a single system. It helps the IT industry to simplify the process of operation and speed up the new application. It is the process of developing a virtual version of physical elements like a storage device, server, network devices, and others. These kinds of elements run on a physical host known as virtualization. This one allows different virtual machine run on the single machine which named as ESXi host. What Are The Different Kinds of Virtualization? It allows the different operating system to run on a single server that highly efficient for the virtual machine. It provides ideal benefits to the industry. Application runs on the host and installed in different forms. This could be accomplished by application streaming, VDI, or desktop virtualization. It is suitable for increasing mobility of different applications and permits migration of VM from the host. It minimizes downtimes of application. From this virtualization, ICA protocol and Microsoft terminal services are developed. Any application can run on the host and allows the client to view in the screen and gains details of running the place. The disk storage of data is combined and maintained by the virtual storage system. It offers abstraction layer that ideal for physical storage to maintain and optimize in virtual deployment. What Are The Solutions Offered by VMware? This is very useful to keep the system running in case any failure occurs in hardware components. Whether the physical server is damaged, all the data and files automatically shift to another server. It provides constant system availability and never minimizes uptime when waiting for any resource to fix the issues in the crashed server. The solution helps you to minimize a number of the physical server that business needs to have. With the virtualization of different servers, this will reduce the need of service and decrease storage space in server. It is better to lower the energy bill. It lets anyone to test different things like system configuration, software, and updates without compromising time and effort to change workstation. It is a simple solution that maintains desktop workstation and also creates a workstation virtual. Updates and software installations are handled at a single place. This will help you to save and money. It is simply and easy to manage, support and provides complete control of workstation.